By far the worst customer service I've ever encountered at an rv park. Internet was horrible when it worked. The pool will give you rashes. Washer and dryers didn't always work. When I ask the manager in the office about the pool, he's reply was well then don't use it! He also said the internet isn't guaranteed ( even though its listed as a perk) and to get a hot spot if I needed to use it for work. I'd recommend you Good Sams do a review of this park. The rating is very misleading should be 5-5-5 in my opinion. The location area is under construction but it's still close to the med center. I’ve lived in this park for a while and it’s really gone down hill. Several of the bathrooms have been closed for maintenance for weeks, the bathrooms that are open are dirty along with the laundry rooms. There’s washers and dryers that have been broken and haven’t been repaired, one of the two dog parks has been closed for months, weeds are everywhere in the flower beds, and the list goes on. The worst part though is the new manager. He is very hateful towards many of us residents and treats us like he’s doing us a favor by allowing us to live here. He definitely doesn’t know how to treat or talk to the residents correctly and unfortunately many of his staff act the same way. I’ve never seen this park with so many empty spots as people are unhappy with the current conditions. Many of us are hoping he leaves before many of us decide to go to one of the many other rv parks in the area. Parks like Advanced RV Resort spoil you. It was a wonderful stop on our trip. We only stayed one night. The facility is well organized. We were led to our site by a helpful man. Set up was easy. The wifi was better than average. We decided that the available TV channels over the airwaves was better than cable. Our site was a pull thru that was easy in and out. We had a concrete slab and there was grass around us. Our dog really appreciated the grass. The park was very dog friendly. The staff were all very friendly. One added bonus. . .we were there on pasta night. For $5 we had an exceptionally great pasta meal. If you stay here, don't miss it. The cook is amazing. The only problem we had was dealing with the Houston traffic and construction getting here. We were traveling on I 10 and found the toll roads a bit expensive to get here. The Sam Houston Parkway wanted $5.25 at each toll booth and we had to pass thru 2 getting here from the west. One of the staff told us how to bypass one toll booth on our return to I 10 when we left. But. . .it was worth to have such a pleasant over night stop. This was my first visit to a Texas RV park. It is truly in like new condition and very well maintained. Very close to the highway which provides easy access to all shopping and points of interest. There is a public park behind the RV park and you can run and bike for a daily workout. I will return !! Very clean, very good hook up set up, located near an highway - very noisy, wifi marginal, staff very polite and friendly. Very nice place to stay. Had only planned on two weeks, but after one week I contacted the hosts and was able to extend my stay to a full month. I did have to move once during my stay, due to extending my stay. First site was a back-in and second was a pull-through. The camp hosts were correct, if you don't make friends here, you didn't try. They were correct and I met some wonderful people. The variety of activities should enable everyone to find something. I did. The activities do change from month to month. I travel last minute, but here I would recommend that you make reservations. I was lucky. The campground is normally full this time of year and was for most of my stay, Houston Rodeo time. I just started RVing in July and this RV park was my first experience with staying at a RV Park. 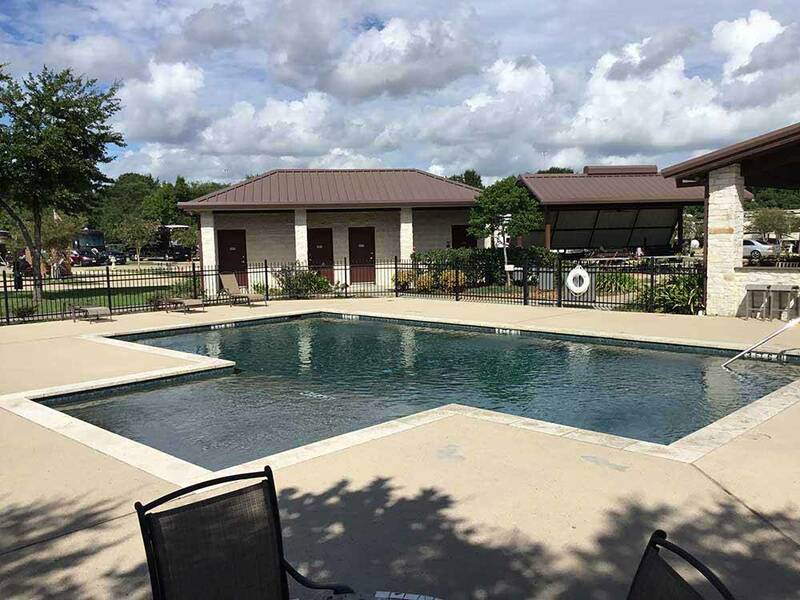 This place is in a GREAT Location, is extremely well maintained, has an OUTSTANDING staff and GREAT amenities. I really do call this place my second home!